Films on A Course in Miracles. The Tao of Kenneth Wapnick and Gary Renard. Ike Allen, the creator of films like A Course in Miracles The Movie and Leap! A Quantum Awakening has released a new video featuring interviews of Kenneth Wapnick and Gary Renard. This updated version blends the original interviews of Dr. Kenneth Wapnick, Gary Renard, Nouk Sanchez, Tomas Vieira and others with new footage of David Hoffmeister and Jon Mundy. 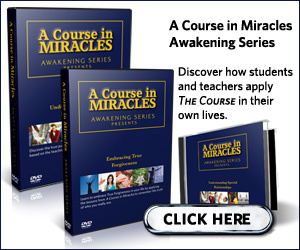 A Course in Miracles Awakening Series - 2 films - Special Relationships and Forgiveness. The A Course in Miracles Awakening Series blends insights & personal stories from Ken Wapnick and Gary Renard, featured in A Course in Miracles The Movie, and others, with messages directly from The Course. Kenneth Wapnick & Friends: Undoing The Ego. This video & audio presentation blends insights & personal stories from Kenneth Wapnick and Gary Renard, featured in A Course in Miracles The Movie, and others, with messages directly from The Course, as read by AVAIYA founder, iKE ALLEN. Discover how students and teachers in the A Course in Miracles community have encountered Ego challenges in their own lives and applied the lessons from ACIM to remove the blocks to love’s presence.